I was charmed. How could I not be? So here is Desiree’s review along with a couple of her photos. 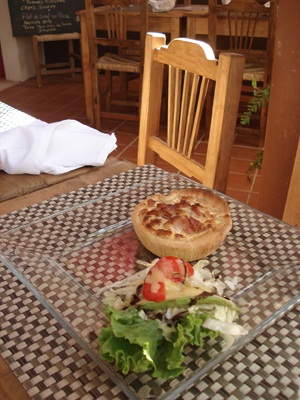 The latest addition to Bucerias, offering modest dining all day long, is the quaint Bistrot O Delices located on Calle Galeana 14A. A bistro (or bistrot) is akin to a café; a small restaurant that serves moderately priced, simple meals in an informal setting. This amazing little gem, offering delices (delicacies) recently opened up on November 25th. The owners, Sandrine Millan and Jean Dubourg, are originally from the south of France where Jean trained as a chef. As you enter, lured by the tantalizing smell that has already captured you from out front, the friendly French owners graciously welcome you. Dangling from the ceiling are colored paper lanterns, in shades of red and purple. Spanish salsa music fills the Bistrot, giving it a lounge-like feel. This place is cool, yet not overdone. The locale, modern meets madera (wood), is chic and slightly romantic in its own way. Eight little rustic tables are nestled into a garden oasis, each set with wicker placemats and white cloth serviettes. A noble tree, rising up out of the terracotta floor, is the centerpiece around which the patio setting has been cast. White bougainvillea, large green ferns, and a dash of other foliage enhance the already relaxed atmosphere. and creamy emmental cheese sandwich), accompanied with a side salad drizzled in oil vinaigrette. Other options include a variety of omelets, quiche, and the recently added panini. If you desire something sweet, try the Pan de chocolate (a mouthwatering chocolate filled pastry). Also available are croissants, muffins, and baguettes served with homemade jam. Another option for the sweet tooth on a hot day is a glace (ice cream with fruit and topping). Each and every day there is a different plat du jour available if you choose to be daring. Individually wrapped homemade jams (strawberry, apple/coffee, berry mix) are also available for purchase and make a delightful gift. Open daily 9am-10pm. 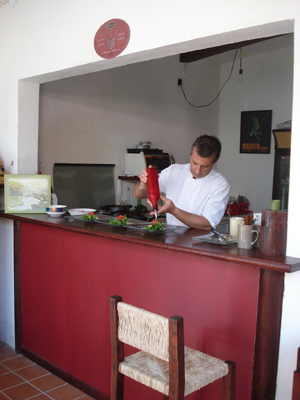 Located at Calle Galeana 14A, half a block up from Mark’s Bar and Grill; 322 158 0937; bistrotdelices@hotmail.com. Mechas ungraciously lording her fish over me. Photo by David Lansing. There were six of us in the little panga. The two boathands, who were busy trying to restart the engine, and four of us fishing: me, Chris, Mechas, and Steve, who lives somewhere in upstate New York and visits his parents who have a house in Custodio every once in awhile. Steve is a very avid fisherman. When I stay at the Fletcher’s house I always see Steve down on the rocks below Casa Corona del Mar surf casting. I’ve never seen him catch anything but I don’t think that matters to Steve. He just likes to fish. While Diego’s friends were trying to get the engine started, we decided to do a little bottom fishing with the dead live bait. We rigged the lines so there was a weight at the end and then a hook about a foot above that and another a foot higher up. Then we’d put the dead live bait on the hooks. The problem was that the dead live bait seemed very old and tended to fall apart as you were looping it on the hook. Or you would get it on the hook only to have it disintegrate the minute it hit the water. Once in awhile you would actually get the frozen shrimp to stay on the hook and be able to lower it down into the water until you felt the weight at the end hit the bottom. After about five or ten minutes you’d reel in the line and invariably the dead live bait would be gone. Was this because a fish had stolen the bait or because it had broken off the hook and drifted away in the current? It was impossible to tell. Finally Diego’s friends got the engine started again and told us we should rig our lines for trolling. They looked at Chris’ many lures and chose one that closely resembled a sardine. Like the live sardines we thought we would be fishing with this morning. But this was just a fake sardine. Which Diego’s friend assured us the fish preferred to the real thing. Why a fish would prefer a fake sardine to a real sardine I cannot say. That is just the way it is. So we all rigged up and we trolled in a big round-about circle over a shallow reef. We could see fish swimming by the boat—large fish like snappers and jacks and Spanish mackerels and there were fish boils in the sea everywhere we looked. The fish in the sea seemed interested in everything about us except our faux-sardine lures. I said Steve was the real fisherman of the bunch and sure enough he got tired of trolling with the fake sardines and brought in his line and put some contraption on the end of it that none of us had ever seen before. It looked kind of like a childs bathtub toy. There was a floaty thing a few feet away from the end of the line and then this gadget that looked a bit like a rubber ducky that, evidently, was designed to dive out of the water and then submerge and then dive again. Sort of like a flying fish. Diego’s friends were quite curious to have a look at the thing. They shook their heads and told him it was no good, but Steve was not to be deterred. He let his line out and the rubber ducky did what it was supposed to, jumping up over the wakes and then diving down beneath the water like a dwarf porpoise. Frankly, I think we all thought he was a little nuts, but what the hell. None of the rest of us were catching anything. Then Mechas, who is also a fierce fisherman (or fisherwoman) decided she’d had enough of the fake sardine as well. She wanted to put on something sparkly and blue that she said she’d had good luck with down in Argentina or Beliz or something. Again, Diego’s friends tried to dissuade her but Mechas was sure of herself. She wanted to try something new. So she changed her lure and let it back out and I’ll be damn if not two minutes later both Steve and Mechas hooked up within five seconds of each other. Chris and I reeled in so as to keep our lines from getting fouled and sat there while Steve and Mechas showed off their fish. I can’t say either one of them was particularly gracious about it. Then Mechas caught another fish and Steve caught a couple more and even Chris caught one. The only person who hadn’t caught anything was me. So Mechas started giving me advice. I needed to change my lure. I needed to hold the pole up higher. I should let more line out. I should jerk the pole every once in awhile. I should change poles. Meanwhile, she and Steve kept bringing in fish. After awhile I put my pole down and got into the food bag and found a bag of chips. I ate most of the chips and then I ate a pear and then I started working on the cookies. There were even some cold beers. “Why don’t you fish?” said Mechas. I didn’t really want it but she was kind of insistent so I took the pole that Mechas had been pulling fish in one after the other and I let the line out exactly the way she told me and I held it high in the air as she instructed and after about half an hour or so I hadn’t even gotten a bite. Diego’s friends said it was time to go in. Which was fine with me since we were almost out of beer and chips. The old men in the sea preparing to fish with live dead bait. Photo by Mechas Grinnell. Yesterday Chris and I drove down the hill to the little village of Plantinitos. It’s not fair to actually call it a village. It’s just a collection of beach restaurants, each looking like the other, a couple of little shops where you can get an inflatable plastic shark or cold Coronas, and, further back in the jungle, a few slapped together houses, made mostly of discarded or recycled construction materials, where the fishermen and their families live. In one of these houses, with chickens and goats and dogs and cats all running in and out of the open doors, lives Diego who, if he doesn’t have anything else to do, will often times take us out fishing. When we got to Diego’s house it was 10 or 11 in the morning but he wasn’t up yet. His wife, who was sitting outside on an upstairs balcony washing clothes in a bucket, went to get him. Diego, shirtless, came out of the house a few minutes later scratching his stomach. Would it be possible to go fishing tomorrow morning? Chris asked him. “¿Por qué no?” answered Diego. Two of his daughters, shoeless and wearing thin faded dresses, leaned into him on either side, holding on to his thick legs as if they were tree trunks. Diego nodded. Chris asked him where he would get the live bait. Diego told him he already had some. Chris said, “¿Aquí?” and Diego yawned and nodded. What kind of live bait is it? Chris asked. “Sardinas congeladas,” replied Diego, growing bored with the conversation. “Frozen sardines?” Chris said, confused. “Yes,” said Diego. “El cebo vivo está muerto.” The live bait is dead. The conversation went around in a circle like this for a few more minutes until Chris made it clear that he was hoping we could get live bait that was alive. Diego let us know this would be more of a problem. To get live bait that was alive he’d have to get up very early in the morning and take his panga around to the estuary and throw a net in the water and catch the fish. This he could do, but it seemed a waste of time. 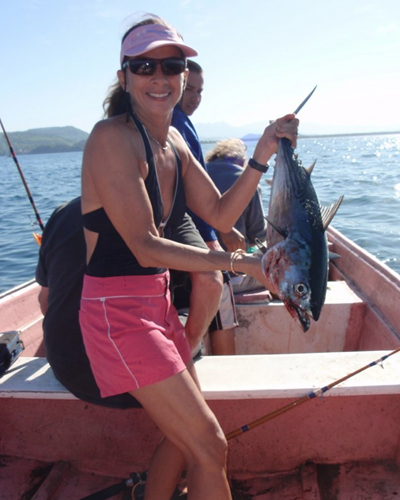 The dead live bait was just as good for catching dorado. Still, Chris said, it would be better if Diego could get the live bait that wasn’t dead yet. This was respectfully agreed upon by both parties and we left. The next morning, we were at Diego’s house before eight. Diego was shuffling about but he did not look like a well man. He told Chris that he would not be going out on the boat with us this morning. He had had surgery for a hernia a few weeks ago and it was bothering him. It would not do, he told us, to be on the boat this morning. But there was no problem. Two of his friends would take us out. They knew as well as he where the fish were. It would all work out just fine, we’d see. We’d catch lots and lots of fish. So we walked across the beach to where one of the men was holding the bow of the panga against the incoming waves and we got wet up to our knees loading the fishing poles and tackle boxes and some food and water we’d brought along—some chips, apples, shortbread cookies. Then we all shoved the panga back and quickly climbed aboard, getting a bit soaked in the process, and the boat floated in the cove just beyond the breaking waves while our two guides attempted to start the rusty outboard engine. They pulled and they pulled and when one got tired, the other gave it a shot, but nothing happened. Meanwhile, Diego was standing on the shore watching us and shouting instructions. After awhile we drifted back toward shore and were caught in the waves and ended up back on shore. Diego rolled up his pants and walked out into the surf and took off the engine’s cover, adjusted this and played with that, then put the cover back on and told one of the men to trying starting it. The engine coughed and belched a white cloud smelling heavily of petrol but after a few minutes it caught and began idling and we headed off towards the distant horizon. I knew that the bank where the fishermen catch dorado was a good 90 minutes away and thinking of Diego standing on the shore watching us and listening to the engine gasp and choke for life, I started having images of us being stranded far out to sea and floating for days with nothing to eat but shortbread and Doritos. “Which way do you suppose the ocean currents flow out here?” I asked Chris. But this was no time to be overly concerned about our safety. We were fishermen. And fishermen sometimes lead a dangerous life. It’s part of the bargain. 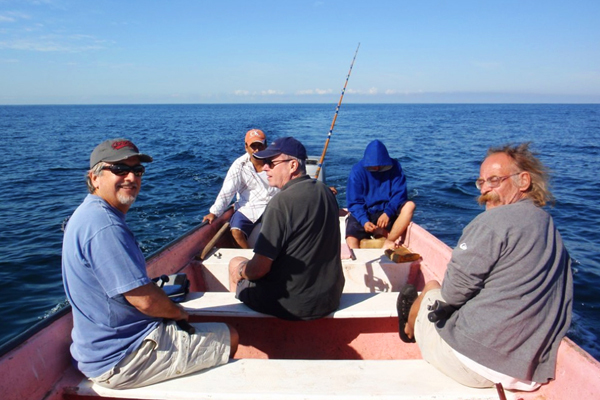 It was time to start rigging our gear and getting prepared to bring in some massive fish, perhaps even a dorado or two. Over the wind and the sound of the misfiring outboard engine, Chris shouted at a sullen looking boathand and asked him where the live bait was. The boy, not more than 15 or 16, fumbled around at his feet until he found a covered plastic bucket that had once held lard and handed it forward to Chris who took the top off and looked inside where there was a plastic bag of frozen shrimp. “The live bait is dead,” he said. But before he could get his line in the water, the engine died again. Mariachi band at the fiesta in Custodio. Photo by David Lansing. Actually, none of these guys could really hold a tune. Listening to them, I sometimes wondered if they weren’t actually singing two or three different songs at the same time. As if the leader of the band had said, “Well, boys, I’m going to sing Cielito Lindo but you guys sing whatever you like.” They did, however, all know how to play their instruments with verve and authenticity, from the two trumpet players to the guy on my favorite mariachi instrument, the profound guitarrón, that large, round-bottomed acoustic bass that makes mariachi music sound like, well, mariachi music. 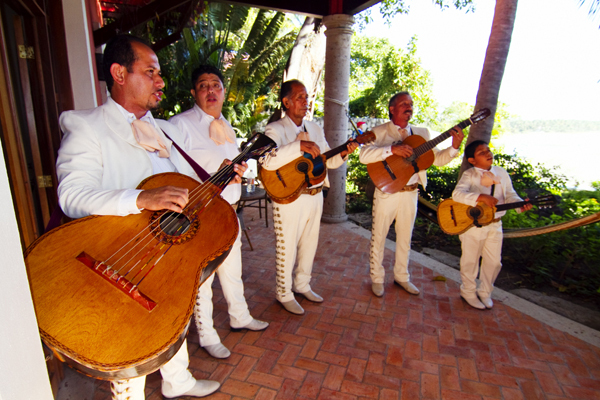 Here’s a sample of the band playing just as we arrived at the fiesta. The Blue Whale in front of Casa Corona del Mar. I’d mentioned that by the time I got to Custodio on Saturday the brakes on my car were gone which is a problem since the nearest mechanic was about half an hour away. Chris said the guys at the front gate were pretty mechanically minded and might be able to fix it if it was something minor. I didn’t think it was minor. 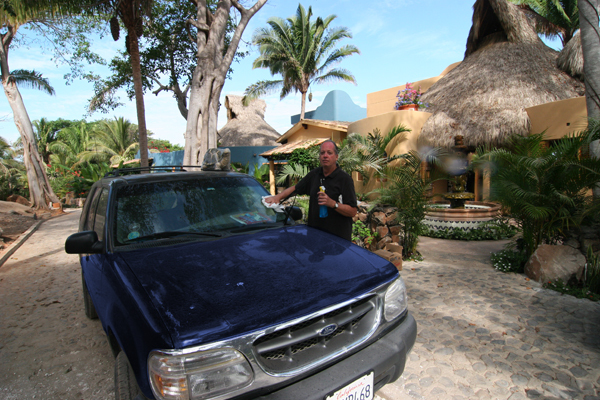 But we walked up to the house at the gate and talked to Ismael, the property manager for the complex, and he promised to have someone take a look at the car. Later Sunday afternoon, Ismael came back to the Fletcher’s house with the car key. He said it was fixed. Chris and I shot each other a look. It didn’t seem possible that someone could have fixed the brakes in a couple of hours. Chris asked Ismael what the problem had been and he said the car was out of brake fluid. So they had poured some in. And that was that. “¿Estás seguro de que era el problema?” I asked Ismael. Yes, he said. That was all. No brake fluid. After Ismael had left, Chris and I talked about it. I told him I knew it was more than just low brake fluid. That wouldn’t explain why the brakes were locking up or pulling to one side or the other. Chris suggested we go have a look at it, so we walked back up to the gate where the Blue Whale was resting in the shade. Chris crawled underneath the engine and I started it up and pumped on the brakes. Chris started hollering. “Turn it off! Turn it off!” He was making so much noise I thought maybe his arm had gotten caught in the fan belt or something. When he pulled himself out from under the car, he was covered in brake fluid. As soon as I’d stepped on the brakes it had started pouring out, he said. So we went back to Ismael’s house. He wasn’t there but someone else was and we brought him out and showed him the lake of dark fluid on the soil beneath the car. “No es fijo,” Chris told him. The man nodded. He said they would have to get a mechanic to come up from Zacualpan and he would charge $20 just for the visit. I told him that was fine and to please arrange it as soon as possible. The mechanic came on Monday and it was announced that once again the Blue Whale had been fixed. I didn’t believe it. I got in the car and started it up and pressed on the brakes and although fluid no longer rushed out to the ground, they were soft and almost reached the floorboard. I had planned on going back to Bucerias Monday morning but Chris and I talked about it and agreed that it would be foolish to drive through the jungle with no brakes so it was decided that since they were leaving on Wednesday, I would just stay over and we could convoy back into town together. Which didn’t seem like such a bad idea. Maybe I’d finally learn how to make really good tortillas.